Copyright �2011 PopEntertainment.com. All rights reserved. Posted: June 10, 2011. Summer is almost upon us, and so is lawn tending, weeding, and planting � gardening tasks shift from background to foreground. And so garden gnomes, those funny little stone or cement guardians of gardening, stand watch over all this leisure activity. What a perfect time to release Gnomeo & Juliet on DVD. And that's just what Disney did. This animated feature tells the tale of two next-door neighbors � Montague and Capulet � who are at war, and so are their garden gnomes, who come alive in some mystical way, while their human counterparts are thoroughly unaware of this miniature society. 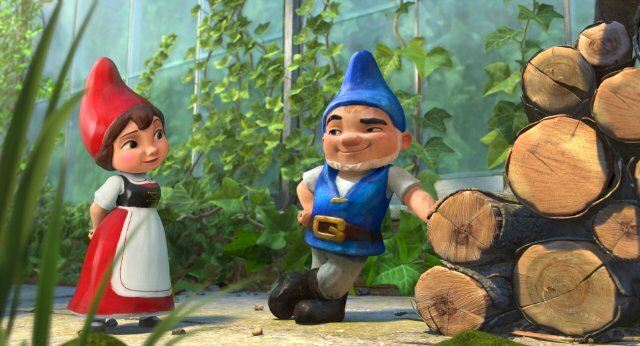 As in the William Shakespeare tragedy, at the center of the violent feud is two children of the belligerent clans, Gnomeo and Juliet, who are in love. Garden gnomes are at war, yes, but tragic consequences � well, this is Disney and for kids so the ending is not quite the one Big Bill envisioned. In this exclusive interview, veteran director Kelly Asbury (Shrek 2, Spirit - Stallion of the Cimarron) tells his tale of the film's creation and all the in-jokes considered. Why is a Texan making a movie where everybody speaks in British accents? Well, because the story is set in Stratford-upon-Avon, which is where Shakespeare was born. I wanted these gnomes to work the very soil from which Shakespeare came so I just figured it had to be England � it was a great place to set the story. And Elton John was doing the music, so that's another English aspect to it. Of course, we have a pretty multicultural cast. [They're] not just British. There's a little bit of Spanish, and some Tennessee in there with Dolly Parton. Texas has very little to do with it except that I always liked animation and love to tell stories, so that's as far as it goes. Did you drag out one of those big Complete Shakespeare books and go through it to figure out the references? That's not exactly how it worked, but it was sort of like that. We did say, �Let's start by thinking of anywhere we can put in a Shakespeare reference of any kind.� Then you screen these movies and workshop them, play around with it, and hopefully strike the balance. [At some point] you realize, �Okay, that's worn out its welcome, let's stop doing that.� We did have fun doing that and tried a lot of different things. Hopefully the ones that ended up in the final film are the ones that get laughs and that people who know about them do notice them. They're for the Shakespeare fans out there. Casting Patrick Stewart as Shakespeare was one of the funniest inside jokes. Absolutely. We had a great time and Patrick did, too. He loved that he was getting to do Shakespeare and he improved a lot of his lines. He really brought a lot to that character, and we had fun in the recording sessions having him do it. Texas is a perfect place to have gnomes in the front yard, back yard or wherever. Did you know somebody that had gnomes? There were people who had gnomes in my neighborhood. Everybody has someone in their neighborhood that gardens too much, are a little too attentive to their garden. Gnomes have been around for a long time. My parents were avid gardeners and they themed our backyard in the Old West. We had wagon wheels and cow heads and lanterns. It was our own little mini Knott's Berry Farm back there. It's in my blood to understand the tacky gardening mentality. How did you get involved? Did you come up with the idea from the start or did the producers call you? They called me. Essentially, it had been in development for some time. 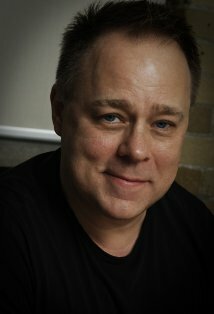 I had finished Shrek 2 and my friend Baker Bloodworth, who's one of the producers � I worked with him years ago on Beauty and the Beast � asked me to be part of this. I read the script and thought it was fun. So I got some ideas and we were really able to start from scratch. We gathered the right team of people to start all over and pull it together in a way I hope people are entertained by. But it wasn't my idea. I wish I could claim it was. I don't know who it was. The original writers were Rob Sprackling and John R. Smith. But I don't know them and never met them, so I don't know how they came up with the idea. For all I know, one day they just said the name gnome and then went, �Hey wait a minute, that rhymes with Rome.� I don't know; I really don't. Did they do the drawings of these characters or were they your invention? They had done some, but I didn't want to see them. I was allowed to start from scratch and we hired designers. Our principal character designer, Gary Dunn, did a lot of work. It took a lot of trial and error. It was about a four-and-a-half-year process � total, from beginning to end � to get the movie actually made and in theaters. When you're making gnomes, can you make them look like the people the gnomes represent? Somehow, the character Jason Statham voices looks just like him. That's an interesting thing that happens in the animation process. We record the actors before we animate the characters. A lot of people think it's the other way around, but it's the actor first. We videotape their faces while they are talking, so the animator works to the soundtrack and has this reference video to look at and get some ideas about how that actor uses [his/her] face. Some sort of osmosis takes place, because that character's moving a certain way actually takes on the appearance of the actor, sometimes. This happens in animation; it's quite fascinating. It's why the genie in Aladdin somehow looks like Robin Williams, even though he really doesn't at all. No, that was Jim Cummings, a really talented voice actor. He's great. 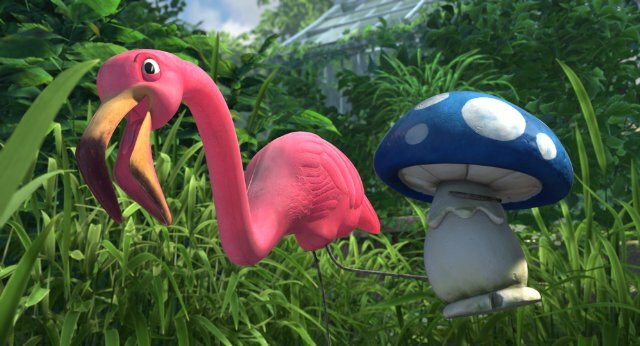 Jim improved a lot of his lines as well and helped us come up with the idea of this Cuban flamingo from Miami. Did you entertain getting Robin Williams for that? He sounds like Williams. We had tried a lot of different ideas and couldn't quite grasp it. When Jim came in we tried several things, and it was his idea to try the Cuban accent. It worked. As for Dolly Parton, has she ever done animation? She has never done one, and it's really great. We had this little gnome that was starting the race, a little gnomette, and she sort of has this country girl look to her. One of our editors said �Why don't you guys get Dolly Parton for this?� We called up Dolly and Dolly said she'd love to do it. We flew to Nashville and we recorded her in an hour. It was fantastic. You have a bunch of novices for animation in this film. To some degree. Hulk Hogan and Ozzy Osbourne were great. Everybody was so professional. It's amazing how they all were able to just jump in the studio and give me exactly what I wanted. It was perfect. Had the two leads, James McAvoy and Emily Blunt, ever played Romeo and Juliet? Should we get ones that have played it or someone that wanted to play it? You know, we didn't think like that. We just knew we wanted good voices with texture, and voices that fit the character design [who] were also good actors that we knew of. James McAvoy and Emily Blunt both did, actually � separately � play Romeo and Juliet on their own, but we never had that as criteria. The minute we asked them, they fell in love with the idea and they agreed to do it. They were very happy to do it. Did they tell you, �Actually, we've played it� or was that a secret? No, they told us in meeting them. That wasn't a criterion to cast the part, though. No, they just happened to have both played those parts in various times of their career. At least it wasn't the other way around. Exactly. Of course in the old Shakespeare days, James could have played Juliet because men played the girls‛ parts. We didn't entertain it, but that's a good idea. Maybe that's my next one. What do you feel are the signature touches to this film, as there are in Toy Story 3? For me, the world that we're in: these gardens and those hard ceramic and concrete characters coming to life that are all weathered and weather-beaten. The film is very successful in engulfing the audience in this world beneath these leaves and in the garden. So that's what I'm most proud of in terms of the setting, and how it's explored and exploited in the story as a story point. Had it always been in the background of the story that there was this other dimension and they're alternate world characters? It's a parallel universe; they're in the human universe and in their own universe. Was that always a part of the story? Did you ever think about keeping it completely separate from the human universe? The whole story of garden gnomes is you put a garden gnome in your garden because it's for good luck. The idea that while these humans turn their back the gnomes garden and make sure the garden looks good. The blue garden is in rivalry with the red garden and vice versa, so they're also neighbors that don't like each other. The human neighbors don't like each other and neither do their gnomes. So we did decide we didn't want the humans seeing the gnomes move because I wanted it to be a very realistic world. I wanted the humans to look as real as possible and I wanted the gnomes to look real. So we said, let's make it one of those stories where when the humans turn their backs, this is the secret world of statues and ornaments. It was as simple as that. When did you decide you were going to veer from big Bill's core story � was it always in mind? The idea has always been there that at some point Gnomeo and Juliet � one of them or both of them � meet a statue of William Shakespeare, who tells them �This is a very familiar story and it doesn't end well.� We always wanted that. We decided, what if our third act is about Gnomeo and Juliet taking control of their own destiny and coming up with a new ending for themselves that might surprise the audience? But without giving it away, that the audience certainly can enjoy but realize okay, they're going to change the ending to the classic story and they're going to figure out a way to do it. That's been in the works from the very beginning and something we hoped we pulled off. Some of the most creative film work is being done in animation. Animation does seem to be on a roll right now. It's because of the movie itself, not the medium. It's not animation versus live action. Everything comes in waves and maybe we're on a good wave right now. 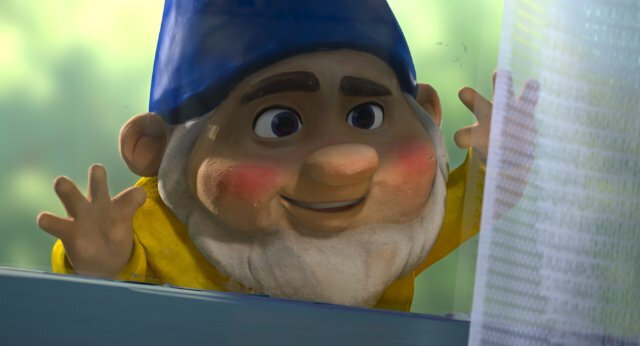 I hope Gnomeo and Juliet rides that wave a little bit. I can't explain why so many of the recent animated films have been so successful, except that they're good movies. An audience likes to pay money to see a good movie, and that's what all of us should try to make. #1 � 2011. Courtesy of Dreamworks Pictures. All rights reserved. #2 � 2011. Courtesy of Dreamworks Pictures. All rights reserved. #3 � 2011. Courtesy of Dreamworks Pictures. All rights reserved. #4 � 2011. Courtesy of Dreamworks Pictures. All rights reserved.